Rate this project Natanael Copa has announced the release of Alpine Linux 3.1.0, a security-oriented distribution built from scratch and designed (not only) for server deployments: "We are pleased to announce Alpine Linux 3.1.0, the first release in the 3.1 stable series. This release is built with musl libc and is not compatible with 2.x and earlier, so special care needs to be taken when upgrading. Please refer to the documentation for information on how to perform the upgrade. Some of the new features are: support for Open vSwitch; Xen 4.4; a release build for Rasberry PI (arm hardfloat); some of the desktop applications that got upgraded and are available for 3.1: X.Org Server 1.16.2, Firefox 31.2.0, Gnumeric 1.12.18, Evince 3.14.1, virt-manager 1.1.0, Claws Mail 3.11.0, Hexchat 2.10.2, VLC 2.1.5, Inkscape 0.48.5, GIMP 2.8.14, Audacity 2.0.6." Here is the brief release announcement. Download the installation CD image from here: alpine-3.1.0-x86_64.iso (306MB, SHA256, pkglist). Alpine Linux is a lightweight distribution which features the BusyBox userland utilities and the musl C library. The project has published a new release, Alpine Linux 3.9.0, which expands hardware architecture support and switches its security library from LibreSSL to OpenSSL. "New features and noteworthy new packages: Support for armv7; Switch from LibreSSL to OpenSSL; Modloop is now being signed; Improved GRUB support; GRUB users should check if their config is generated correctly and have emergency boot media prepared. Significant updates: Linux 4.19; GCC 8.2.0; Busybox 1.29; musl libc 1.1.20; Go 1.11.5; LXC 3.1; PostgreSQL 11.1; Node.js 10.14.2; Crystal 0.27; Zabbix 4.0.3; Nextcloud 15.0.2." The release announcement also mentions that the Firefox browser will only be available on the x86_64 build of Alpine Linux due to its dependency on Rust. Download (pkglist): alpine-standard-3.9.0-x86_64.iso (111MB, SHA256, signature), alpine-extended-3.9.0-x86_64.iso (399MB, SHA256, signature). Alpine Linux is a lightweight Linux distribution designed with performance and security in mind. The project's latest release, Alpine Linux 3.8.0, includes support for Raspberry Pi 3 computers and the 64-bit ARM (aarch64) architecture. The distribution has also added support for the Crystal language. The release announcement reports: "We are pleased to announce the release of Alpine Linux 3.8.0, the first in the v3.8 stable series. New features and noteworthy new packages: support netboot on all architectures; add arm64 (aarch64) Raspberry Pi image; add support for Raspberry Pi 3 Model B+; support ISO image on s390x (KVM installation); end of support for hardened kernel (unofficial Grsecurity); Support for Crystal language. Significant updates: Linux kernel 4.14, Go 1.10, Node.js 8.11 (LTS), Rust 1.26, Ruby 2.5, PHP 7.2, ghc 8.4, OCaml 4.06, R 3.5, JRuby 9.2. Thanks to everyone sending in patches, bug reports, and new and updated aports. The full list of changes can be found in the git log and bug tracker." Download (pkglist): alpine-standard-3.8.0-x86_64.iso (104MB, SHA256, signature), alpine-extended-3.8.0-x86_64.iso (371MB, SHA256, signature). Natanael Copa has announced the release of Alpine Linux 3.6.0. 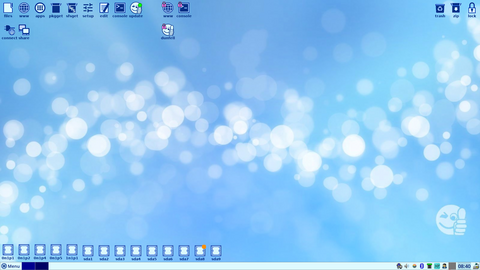 Alpine Linux is an independent, minimal operating system that is well suited to running servers, routers and firewalls. Version 3.6.0 introduces support for 64-bit POWER machines, 64-bit IBM z Systems computers and features many up to date packages, including PHP 7.1, LLVM 4.0 and version 6.3 of the GNU Compiler. "Noteworthy changes: the 'llvm' package has been changed to be provided by a versioned 'llvmX' package, which is presently 'llvm4'; the '-grsec' kernel-related packages have been renamed to '-hardened'. Development-related changes: MD5 and SHA-1 hashes have been removed from APKBUILDs, being obsoleted by SHA-512; 'set -e' is now implied in APKBUILDs, automatically failing the build upon unhandled failing commands; a 'check()' function has been added to APKBUILDs that allows packages to run test suites after 'build()', ensuring no regressions have occurred, this has been implemented for a number of packages, and policy onward will be to have them either be present or explicitly opted-out of with good reasoning." A complete list of changes and credits can be found in the release announcement. Download: alpine-standard-3.6.0-x86_64.iso (106MB, SHA256, signature), alpine-extended-3.6.0-x86_64.iso (329MB, SHA256, signature, pkglist). The Alpine Linux project, an independent Linux distribution developed with embedded systems and security in mind, has released Alpine Linux 3.5.0. The new release switches the distribution from using the OpenSSL security library to LibreSSL, introduces support for ZFS as the root file system and features many package upgrades. "New features and noteworthy changes: Switch from OpenSSL to LibreSSL; Support for aarch64 (uboot only for now); Support for ZFS as root; PostgreSQL update to 9.6.x - see the PostgreSQL documentation for upgrade instructions; Samba 4.5.3; GTK+3.0 3.22.5; glib 2.50.2; Support for R, JRuby and OCaml; Better Python3 support; The nodejs package was renamed to nodejs-current and moved to the community repository. The nodejs-lts package was renamed to nodejs. This means that you get the LTS version if you do 'apk add nodejs'." Further details can be found in the release announcement. Download: alpine-standard-3.5.0-x86_64.iso (78.0MB, SHA256, signature), Download: alpine-extended-3.5.0-x86_64.iso (249MB, SHA256, signature, pkglist). Natanael Copa has announced the launch of Alpine Linux 3.4.0. Alpine Linux is a lightweight distribution which uses the musl C library and the BusyBox userland utilities. The latest version of the distribution supplies users with version 1.14 of the MATE desktop and version 4.4 of the Linux kernel along with LibreOffice 5.1. "We are pleased to announce Alpine Linux 3.4.0, the first release in v3.4 stable series. Some of the new features are: Linux 4.4 kernel; new ISO image for virtual machines; support for DNS search in /etc/resolv.conf; PostgreSQL 9.5. Noteworthy changes when upgrading: the PHP packages got renamed from php to php5; the cron service got renamed to crond; BusyBox ping now use unprivileged ICMP sockets so binary does not need to be suid root, this means you need to be in group with GID 999-59999 to be allowed to send pings; most ruby-* packages were removed, use gem instead." The release announcement has further details. Download: alpine-3.4.0-x86_64.iso (87MB, SHA256, signature), alpine-extended-3.4.0-x86_64.iso (353MB, SHA256, signature, pkglist). Natanael Copa has announced a new release of the Alpine Linux distribution. Alpine Linux is a minimal, independently developed Linux distribution, designed to run on firewalls, VPN services and low-resource devices like the Raspberry Pi. The latest release, Alpine Linux 3.3.0, ships with version 4.1 of the Linux kernel, GCC 5.3, LibreOffice 5.0 and version 1.12 of the MATE desktop environment. This release is available in several flavours: "We are pleased to announce Alpine Linux 3.3.0, the first release in v3.3 stable series. The ISO images have been renamed. Current images are now: alpine (previously ‘alpine-mini’). Minimalist boot media for network access. alpine-vanilla (same as before). Same as ‘alpine’ but with vanilla kernel. alpine-extended (previously ‘alpine’). Same as ‘alpine’ but with slightly more packages available in the repository. Handy where network access is limited. alpine-xen (same as before). Boot media for Xen Dom 0. alpine-rpi (same as before). alpine-uboot (same as before). General ARM image." Further information on Alpine Linux 3.3.0 can be found in the project's release announcement. Downloads (SHA256): alpine-3.3.0-x86_64.iso (82MB, SHA256, pkglist). Natanael Copa has announced the release of Alpine Linux 3.2.0, a security-oriented distribution built from scratch and designed primarily for server deployments (and with some desktop packages available from the project's online repositories): "We are pleased to announce Alpine Linux 3.2.0, the first release in the 3.2 stable series. This release is built with musl libc and is not compatible with 2.x and earlier, so special care needs to be taken when upgrading. Please refer to the documentation for information on how to perform the upgrade. Some of the new features are: Linux kernel 3.18; GCC 4.9.2 / musl 1.1.9 + fortify; MariaDB 5.5 replaces MySQL; Postfix 3.0; Lua 5.3 support; Ruby 2.2; Xen 4.5; Samba 4.2; MATE desktop 1.10; LibreOffice 4.4; Qt 5.4; Kodi (previously known as XBMC) 14.2. Some of the desktop applications that got upgraded and are available for 3.2: Xfce 4.12; X.Org Server 1.17; Firefox 38; Evince 3.16; virt-manager 1.2; VLC 2.2; Inkscape 0.91; Audacity 2.1." Here is the full release announcement with commit statistics. Download the installation CD image from here: alpine-3.2.0-x86_64.iso (298MB, SHA256, pkglist). Natanael Copa has announced the release of Alpine Linux 3.0.0, a security-oriented distribution designed primarily for servers: "We are pleased to announce Alpine Linux 3.0.0, the first release in the 3.0 stable series. This is the first release with musl libc instead of uClibc and is not ABI compatible with earlier versions, so special care needs to be taken when upgrading. Since v2.7, among the various bug fixes, several packages have been upgraded: Linux kernel based on 3.14.5, LXC 1.0.3, QEMU 2.0.0, Asterisk 12.3.0, OpenSSH 6.6p1, OpenJDK 7, Varnish 4.0.0. Some of the desktop applications that got upgraded and are available for 3.0: X.Org Server 1.15.1, Firefox 29.0.1, Gnumeric 1.12.8, Evince 3.12, VLC 2.1.4, Inkscape 0.48.4, GIMP 2.8.10. A port for ARM has been created, but it is still experimental and not included in release builds." Here is the full release announcement. Download the installation CD image from here: alpine-3.0.0-x86_64.iso (290MB, SHA256).